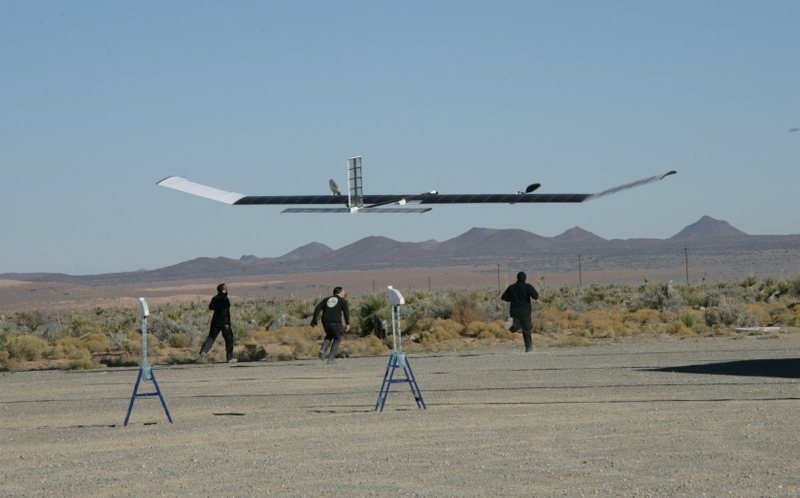 QinetiQ, Europe's largest science and technology organization, has completed the first flight trials of Zephyr - a High-Altitude, Long-Endurance Unmanned Aerial Vehicle (UAV) that has a 12 meter (39 ft) wingspan but weighs just 27 kilograms (59 pounds). The trials took place at the White Sands Missile Range, New Mexico, USA. Two aircraft were flown for four and a half and six hours respectively, the maximum flight times permitted under range restrictions. The maximum altitude attained was 27,000 feet above sea level. The ultra-light aircraft is solar-electric powered, autonomous and is designed to fly at altitudes as high as 132,000ft (25 miles/40km), above normal commercial air-lanes and most weather. The platform is capable of continuous operation through the use of solar power and low drag aerodynamics. 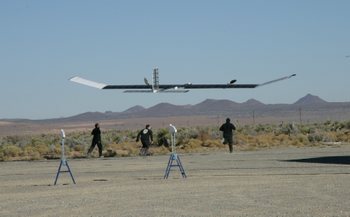 The combination of solar panels on the upper wing surface and rechargeable batteries allows Zephyr to be flown for durations of many weeks and even months. United Solar Ovonic’s lightweight solar cells have been incorporated into the Zephyr which is powered by approximately 1 kW of United Solar’s lightweight thin film PV. QinetiQ believes that stratospheric platforms will rapidly become commercially viable and revolutionize future communications. High altitude platforms of this sort could provide a cheaper alternative to satellites in remote areas and developing countries. They can also enable observation of natural disasters and humanitarian crises. It's one of the holy grails of powered flight, being able to fly indefinitely on solar power. There are several organizations working on this, the pay off for this will be big. The big problem is finding low weight high-density power storage for non-daylight hours. ALTAIR NANOTECHNOLOGIES (http://www.altairnano.com/) recently announced a breakthrough lithium battery which could cut battery weight in half (http://www.evworld.com/view.cfm?section=communique&newsid=10734). Also, at that altitude, the plane could soar for much of the night, then climb during the following day. Stratospheric platforms are a great idea. Like many new technologies, the challenges would be best solved if they were approached separately. First, aircraft of various specific payload-carrying capabilities need to be designed. Second, kits containing solar panels, batteries and communications gear need to be designed to meet the different payload levels. Third, information on stratospheric winds needs to be made widely available so that planners can know how feasible various schemes are. Fourth, communications models need to be standardized and approved by various governments. Stratospheric platforms can only succeed if the United States and the European Union fund and champion them. That's a very interesting prospect - but moreso for the military than the progressive energy camp. Aircraft that can stay in the air for such long periods of time without resupply would be a great asset. I am writing on behalf of the Web Development Team here at Silicon Solar, a company located in upstate New York and we are promoting Renewable Energy. We offer an extensive line of home electric and hot water systems to garden lights and fountains, great for any budget. In addition to home décor, we also offer an exclusive line of DIY kits from cells to solar cars, which are great for educational purposes. Silicon Solar includes an active and involved staff that wants to make a difference. A main priority Silicon Solar focuses on, is educating today’s youth. Renewable Energy is starting to become more and more popular, it is important these youth are educated-it is their future! Silicon Solar dedicates time and resources to local area schools, providing them the educational tools to learn and understand the benefits. These students are putting together the systems with the help of Silicon Solar’s Team and will continue to observe data. What better way than to learn firsthand and experience the educational benefit. Silicon Solar has donated a SunMaxx Thermosyphon Solar Hot Water System to a local school for the educational purposes. The Solar Hot Water System allows the students to work first hand with cutting-edge technology along with understanding the economic and ecological benefits. Through research and understanding, the students plan to monitor the Solar Hot Water System readings and will be gaining more and more understanding of the future technology. This past fall, Silicon Solar installed its own SunMaxx Solar Hot Water System and a PV System to charge a battery bank in our Bainbridge, NY facility. Having this set-up is great for viewers and visitors to see exactly how the Solar Hot Water System and the PV System ties into your home. Viewers and visitors get the opportunity to see firsthand the installations, along with the benefit of speak with a highly educated representative. You can visit our News & Press Releases at http://www.siliconsolar.com/news-and-press-releases.php for more featured news articles on Silicon Solar. Educating today’s society on Renewable Energy is a big task however, very beneficial. With having Silicon Solar as a link on your webpage, the word of Renewable Energy can be spread - one click at a time. We appreciate your time and consideration and we look forward to hearing from you. I don't knoe if it's appropriate or not to post job opportunities on this blog, but I am a partner in an Executive Search Firm that is seeking an Electrical Power Systems Engineer for a client.The position will be located in either their Virginia or Mass. facility. They prefer a full time employee, however will consider a contractor. This person will be responsible for electrical engineering and conceptual design associated with electrical power systems and electric propulsion for unmanned aerial vehicles (UAVs) at Aurora’s Research and Development Center. Work will focus on developing innovative air vehicle designs including high-altitude UAVs, long-endurance UAVs, micro- and nano-UAVs, and other types of aircraft. This person will perform design and development of electric-based aircraft propulsion systems, including motors, batteries, power control electronics, and solar cells. This will include elements of electrical, systems, and mechanical engineering.•	Minimum B.S. in electrical, mechanical or aerospace engineering. Advanced degree preferred. •	Experience and formal education in the design of aircraft electrical power systems, including configuration trades, sizing, modeling, systems architecture, component selection, and design optimization. •	Must be familiar with solar cell technology, high performance power storage devices including batteries and fuel cells, and reliable energy management and storage systems. •	Must have knowledge of entire system chain of electric storage and propulsion, ranging from battery chemistry and charging to motor and power controllers, to advanced brushless motor design. I thought given the nature of this blog there might be someone interested or may know of someone looking for an exciting opportunity. Anyone interested can contact me directly at kdzierzawiec@fhsolutionsgroup.com. Thank you all for your time and for creating a very interesting blog. That's a very interesting prospect - but moreso for the military than the progressive energy camp. I believe solar powered products are going to be the way of the future. Great post! This is a fantastic presentation which captures what technology is all about. Thanks you for sharing and may you have many thought provoking conversations! very interesting how these monsters and know the physical machines and logic with which are huge and heavy machinery after the heavens am extremely attention, congratulations on the excellent blog topic. click on the link above to read more of them..
A solar cells manufacturing factory in US $? A solar panels manufacturing factory? The cost of the land should not be included. Just the machinery, training, etc (from A to Z). This article and some of the posts have given me an idea. Why doesn't the United States become the world leader in solar technology? This could result in perhaps millions of new jobs in an area that would significantly reduce our dependence on getting oil from countries that do not look at us so favorably. A good idea indeed! But, what about the oil tycoons who have invested billions in oil industry? If somebody was really interested then a lot of research would have been carried out in improving the efficiency of solar cells. It wasn't something that couldn't have been achieved. I'm glad that a lot more people are taking renewable energy far more seriously these days. I'm certainly a fan of renewable energy and love the feeling of knowing I am helping the environment, even if I am just one person! Hopefully much more persons will come around in time, sooner the better! I live in California and we have panels up on the roof for solar power, operates good! excellent grouping has remained for decades because of its great original music with a touch that only the CRC could give, thanks for the excellent blog topic and always live rock ...!! I really like this write! I enjoy it so much! thanks for give me a good reading moment! Good post again.Thank you for sharing, I hope you happy and wish you good luck! this helpful information. Solar Powered UAV is an amazing idea and a thing which can be called as for which the future is based on because things like this only be find in the future. I was read about solar that health care facilities are becoming increasingly open to the idea of solar energy as a source of power in an emergency situation. This would allow a hospital to continue functioning even if the power failed for some reason and a backup generator system was unable to meet the current demand for power. This is a fantastic read. You have mentioned some valid points, That could be very helpful for the reader's. good work you did on this site, keep it up. I love returning back to this site and reading the quality content you always have on offer. The energy from the sun is totally natural and has been used to heat water since the world began. Manufactured systems have been used to harvest the solar energy since the 1800s. The Solar Powered UAV, is some thing nice to get know about and I think this is some thing which can makes betterment for the work. It is really amazing what we can do with solar energy. This post is a small example of just that. To prove Matt wrong, I remind readers to review most of the comments posted by jb these last few months. It's funny, people who spent years demonizing unions, socialists, other lefties, and bill Clinton are crying now that the shoe is on the other foot. Thanks for an excellent article! I appreciate your insights and agree with what you wrote. This is really something else. We will share this with the class. Good job. These machines are genius. Talk about the technology. I am surprised that they can fly in most weather conditons. Clearly they are durable despite their lightweight and solar power base. Solar panels make use of renewable energy from the sun, and are a clean and environmentally sound means of collecting solar energy. Here at solar panel information, we've amassed a wealth of information relating to solar panels and the field of photovoltaic technology. You can learn how solar panels work, how they are manufactured, where to buy them, and how to set them up. If you are looking for information on solar panels and don't know where to start, check out our solar panels section to learn more about how these photovoltaic cells are derived from silicon and what solar energy means to you. Very informative. Please write more so that we can get more details. I would like to say that it is very interesting to read your blog. I am quite sure they will learn lots of new stuff here than anybody else. Each time you commit words to paper in your own inimitable style, you declare your character and personality traits, your talents and abilities, even your current mood.